I don't quite get it, but apparently poke is a thing now, and one of the latest entrants in an increasingly crowded field is the subject of this report. I've been staying away from the new crop of poke-centric places for the most part, but checked out Ohana since it comes to us from Chef Eric Park. Park, of course, is the man behind Black Hogg, Sopressata, and Hero Shop, which used to occupy Ohana's address. I've always had good experiences with his restaurants in the past, so I felt compelled to give this one a go too. Inside, things look much the same as they did in the Hero Shop days. The biggest change is the removal of the large chalkboard that previously lined the right wall. 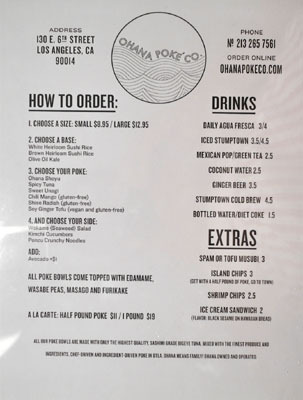 Ohana's menu features a build-your-own-poke type format, joined by a handful of drinks and extras. Click for a larger version. 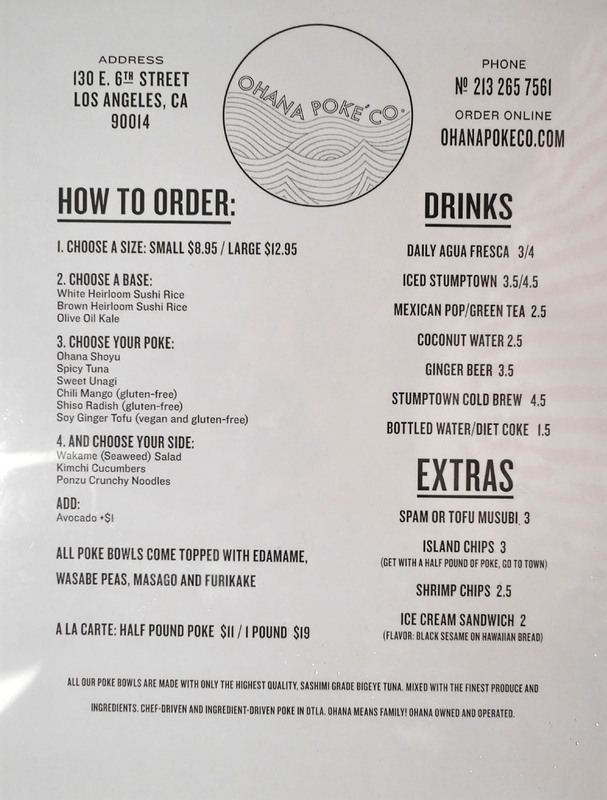 We wanted to try all six varieties of poke, and thus ended up ordering three half-n-half servings to share amongst us. Kicking things off was the shoyu, a classic preparation that really showcased the depth of soy sauce against the backdrop of the fish. The spicy tuna version was also on point, offering up that O.G. creamy heat that never fails to satisfy. 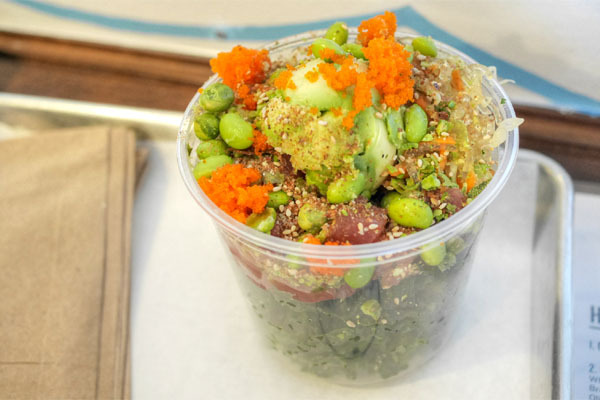 I was a big fan of the textural contrast provided by the edamame, as well as the slick bite of wakame seaweed. An additional topping of avocado for a buck more, meanwhile, gave things a very palpable lushness, but wasn't strictly necessary. 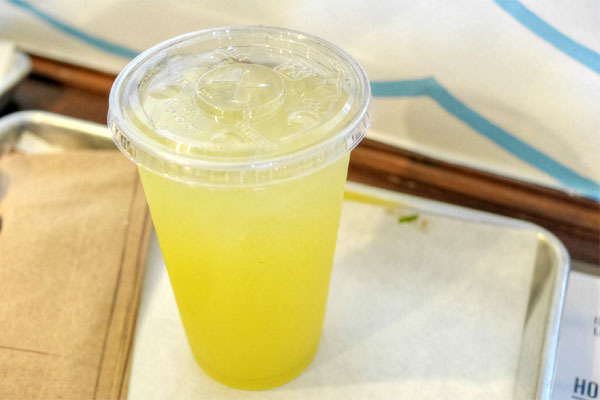 Ohana's Daily Agua Fresca [$4] was a fun, refreshing, pineapple-y concoction this evening. An eel sauce-marinated poke conveyed a subtle sweetness that made sense with the tuna, while the chili mango gave up a restrained, tropically-tinged heat. I got a nice crunch from the oi kimchi as well, and the bowl also featured brown rice, which I found noticeably heartier, nuttier compared to the sushi rice above. 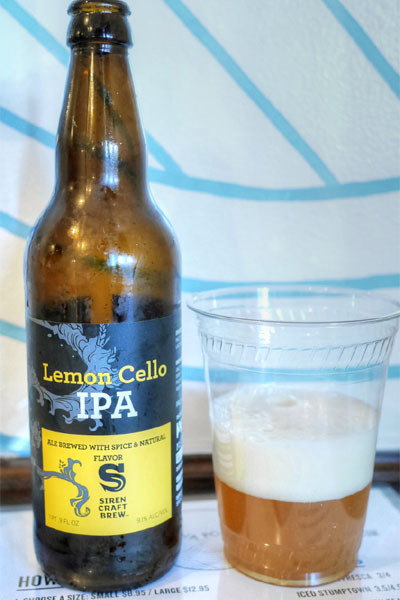 We snuck in a couple bottles, and BYOB'd with the Siren Craft Brew Limoncello IPA, a collaborative beer from Hill Farmstead and Mikkeller that's meant to mimic its namesake Italian lemon liqueur. I think it did a pretty reasonable job, actually. I found the beer expectedly hoppy on the nose, but with a strong citric component, while on the palate, things got quite a bit boozier, with some darker notes coming in over a base of sour lemon. Our final bowl featured a base of kale, which was actually weightier and more substantial that I'd initially envisioned. As for the poke, the shiso-radish variety did a commendable job showing off the tanginess of the shiso, though I didn't get as much from the radish. Meanwhile, the tofu "poke" was a pleasant surprise, coming in as a pretty reasonable substitute for actual fish. Fantastic crunch here from the ponzu noodles to boot. 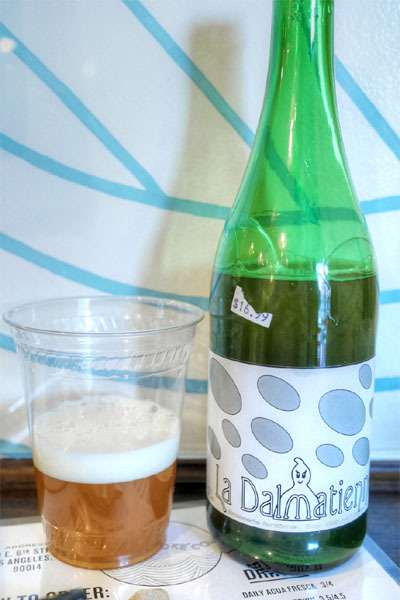 Next to drink was the Fantôme La Dalmatienne. Done in the saison style, this was light 'n' fruity to the smell, while I found it much more interesting taste-wise. Think bubble gum initially, joined by spice, hops, grass, and a distinctly weed-y characteristic. 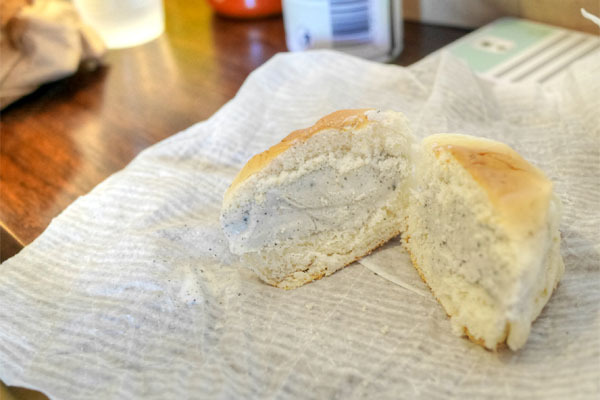 We concluded with one of the least visually-appealing ice cream sandwiches that I've encountered. It was tasty though, almost coffee-like at first, but with the nuttiness of the sesame coming through later, the whole thing well-matched to the sweetness of the bread. I've never been a huge poke fiend, but Ohana did manage to deliver. 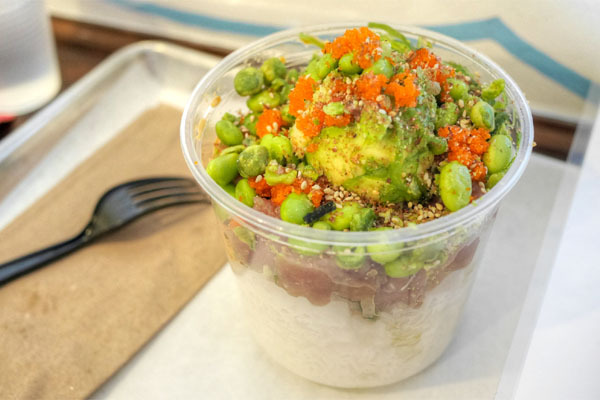 I had no complaints about the fish itself, which came out clean, well-textured, and smartly seasoned, and I enjoyed how the various accoutrements offered up additional dimensions to the poke. I could see myself coming here regularly if I lived in the area. Given the lack of true dessert at Ohana, we set up shop outside and enjoyed some pie from Cole's next door. 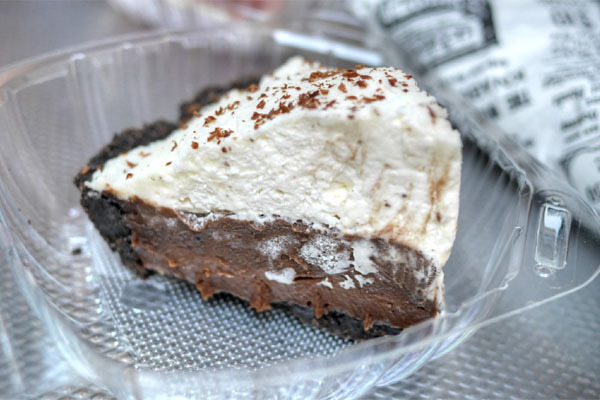 First up was this chocolate cream version, one that wasn't overly sweet, balancing the chocolate against the comparatively light whipped cream up top. I was a fan of the rich, crumbly crust here as well. 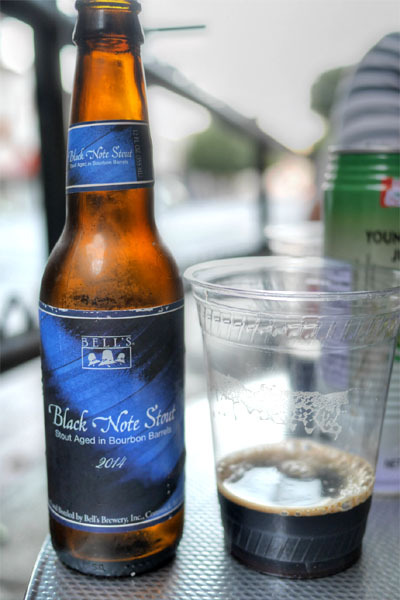 Some more dessert-y beers were called for, such as the 2014 Bell's Black Note Stout. An imperial stout aged in oak bourbon barrels, it had a surprisingly weak nose for me, of mostly dark fruit. On the tongue, more dark fruit, chocolate, malt, booze, and a palpable tartness. I wasn't too impressed given how much acclaim this beer gets. 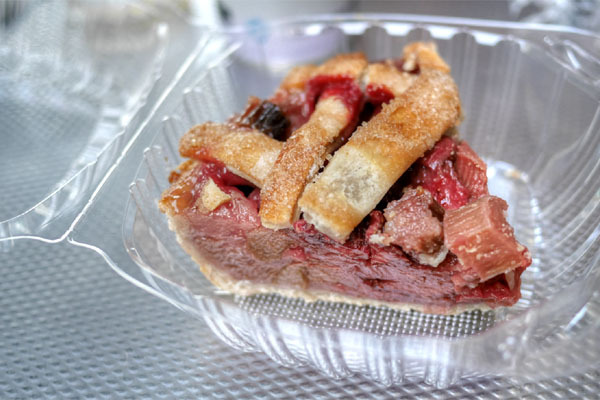 The next pie featured the classic pairing of strawberry and rhubarb, resulting in a marriage of sweet-tart flavors along with a nicely flaky crust. 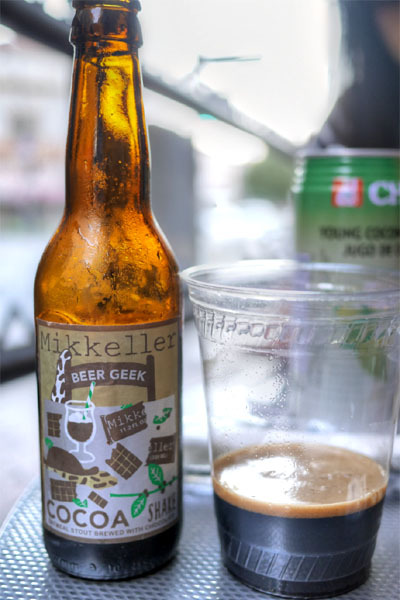 Our last drink brought out the 2014 Mikkeller Beer Geek Cocoa Shake, an oatmeal stout brewed with chocolate. This sounded like a good idea, but didn't work for me due to the overwhelming artificial cocoa powder notes present. 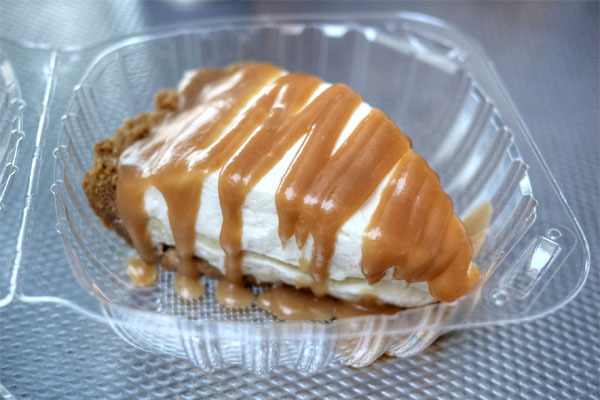 My favorite of the pies was definitely the banana cream version, largely thanks to its near-perfect interplay between the fruit and the drizzles of caramel present. Great crust here, too. 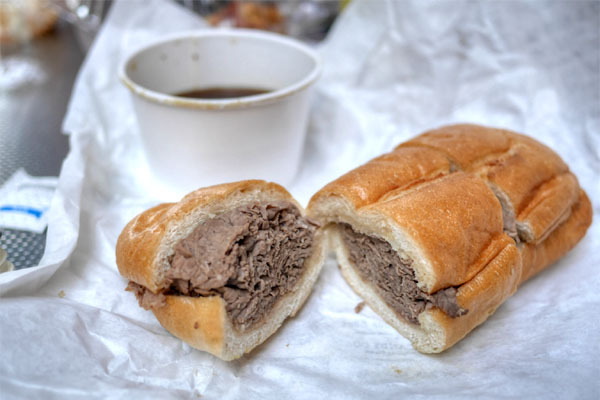 Surprisingly, I'd actually never had the French dip from Cole's before. I don't think I was missing out though, as I found the sandwich underwhelming. The meat veered dry, one-note, and somewhat difficult to eat just by itself. The au jus was absolutely necessary to get it down, and even then, it wasn't particularly memorable. 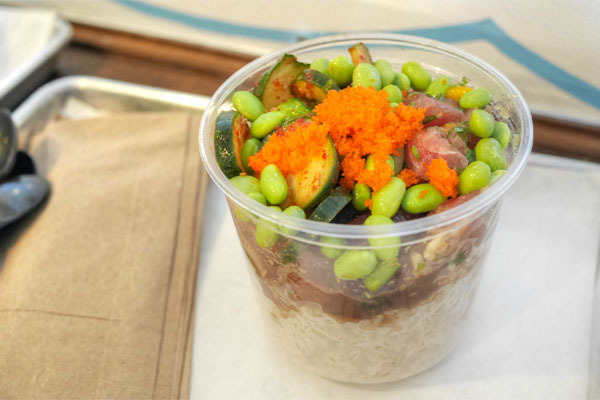 I'm a fan of this bibimbap style of poke, and I hope it trends in my city as well. 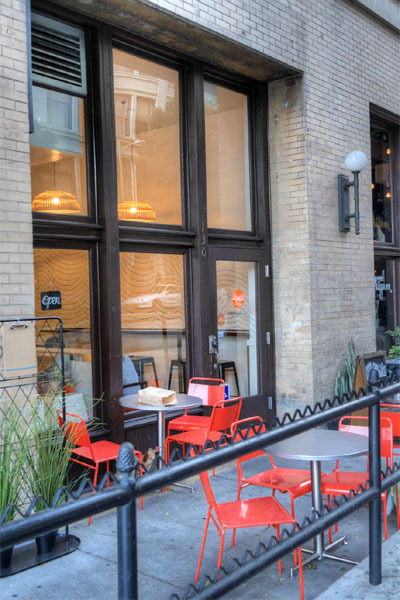 It's not worth a drive, but it's perfect for a quick and clean lunch on a busy work schedule.